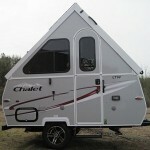 Although Chalet RV manufactures both pop up trailers and traditional travel trailers, all of their pop ups are a-frames. 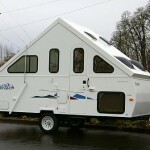 They have offered a range of models, from the 1,150lb LTW to the Chalet XL 1938, which is rare in the world of pop ups in that it offers a “dry bathroom.” For anyone who is unfamiliar with pop ups and other smaller RVs, a “dry bathroom” just means that the toilet pedestal isn’t integrated into the shower. 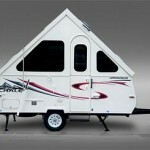 And for anyone who is keeping score, the dry bathroom in the XL 1938 is also the largest available in an a-frame. 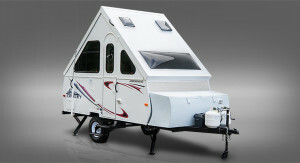 Although the XL 1938 isn’t part of Chalet’s 2015 lineup, it is still available in old stock and on the used market. 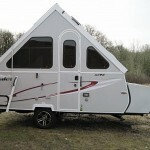 Some Chalet a-frames also include pop up skylights that increase the amount of light in the unit and provide more headroom for taller campers. 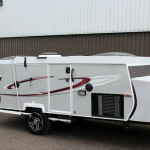 That takes care of one of the major complaints that people have against a-frames, and some of Chalets models also come with powered roof lifts to make setup easier.